2017 Veterans Assembly At C.U.E. The City of Collinsville will honor our Veterans the week of November 5-11. Area merchants and businesses will be offering discounts and specials throughout the week and there will be various events and activities taking place in the community and at the schools. On Tuesday, November 7, The Sale Barn Theatre located on Old HWY 169 (Garnett) between 136th & 146th North in Collinsville will be hosting two special screenings of the documentary Project 22. Project 22 features local Veteran Anthony Marquez and addresses the hard hitting issue of PTSD and suicide among our more recent Veterans. The movie has been deemed a must see for all Veterans and those who know them. Afternoon Screening- Lunch will be served free of charge to Veterans and their guests before the afternoon screening of Project 22 at the Sale Barn Theatre beginning at 12:00 noon with the movie to be shown at 1:30 p.m. The movie will be shown with step theater style seating with limited floor seating available. Those wishing for floor accommodations should let staff know upon arrival. Evening Screening - The Sale Barn Theatre will play the Project 22 movie for an encore screening at 6:30 in the evening. The movie will be shown with step theater style seating with limited floor seating available. Those wishing for floor accommodations should let staff know upon arrival. Veterans Appreciation Ceremony - Join the City of Collinsville for a Veterans Appreciation Ceremony honoring our Veterans beginning at 8:00 a.m. at the Veterans Building located at 903 W. Main Street. We will have a keynote speaker, laying of the wreath, and 21 gun salute. The City of Collinsville will also be designated as a Purple Heart Community at the Ceremony. 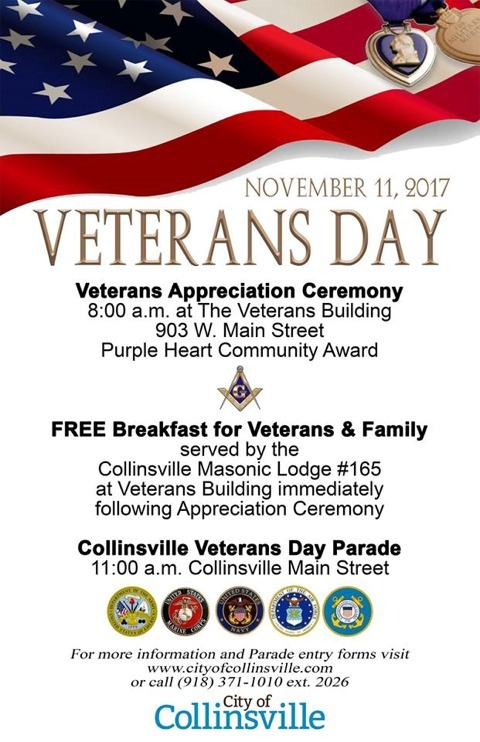 Breakfast -The Collinsville Masonic Lodge #165 will be serving breakfast to Veterans and their families free of charge immediately following the Appreciation Ceremony at the Veterans Building. Parade- The traditional Collinsville Veterans Day Parade will take place at 11:00 a.m. Bring the family to Main Street to help honor our Veterans. Everyone is encouraged to participate and enter the parade to honor the men and women, past and present, who have served in the military to protect the freedoms we now enjoy. All entries should show appreciation for our veterans. For more information concerning the Veterans Appreciation Activities for the week please contact Sherry Campbell at City Hall (918) 371-1010 ext. 2026 or email at scampbell@cityofcollinsville.com .